A box of the new wracks, a wraith and a rather frenzied kit bashing spree resulted in this nasty customer. I've had the idea to make a different looking haemo out of the wraith for awhile and finally we got the wrack kit to provide some necessary extra bits! Gonna leave it be for awhile and get back to it after some pondering... It's not 100 % yet - but it's a start. Any improvement ideas are more than welcome! He looks great, I really like the balance. I don't think he needs much but if I was to add anything I'd probably add some wires hanging from his mouth from beneath the veil so you don't exactly know what it is but you get the Chtulu association. Just an idea. Yet another badass conversion. Great stuff! The Cairn Wraith is such a good basis for kit bashing. That looks great. Where are the hands from? Is the wrack box as insanely useful as it seems? They´re both from the wrack kit. It´s a real treasure trove bits wise even if I´m a bit torn about the models when put together as intended. 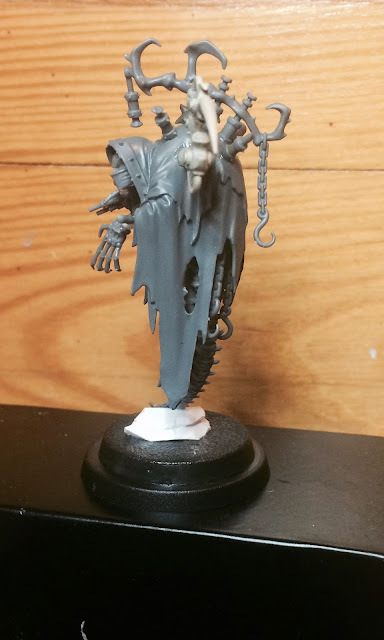 Something to add to it's "tail" area, hanging down to bulk it up some and make it less.... necron? Otherwise, tis sinister indeed. Love the head and it's positioning. Well - the plan is to have a few more chains hanging down at the back, but I like the profile of the tail/spine sneaking down. Don't want it too cluttered. When I saw the Wrack kit, I was instantly excited to see what you would do with it. You did not disappoint. Great job man, I can't wait to see what else you crank out with that kit. Have you thought about turning his head to face the same way as the little pointing arm(which is really creepy by the way) That way his pose would form a sort of curve following the pattern created by the tail. Of course you might have already glued his head in place. 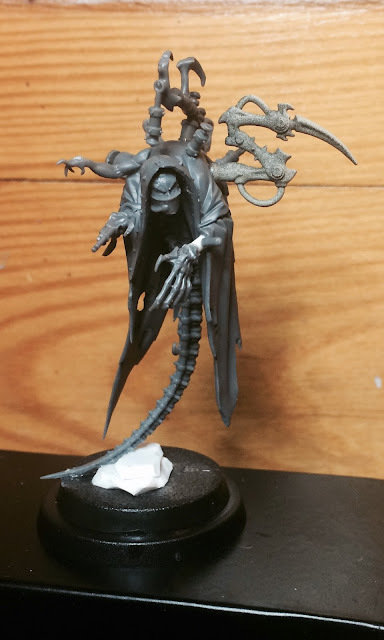 I've seen a lot of wraith conversions, but I don't think I've ever seen one done as a Dark Eldar before. Cool idea. 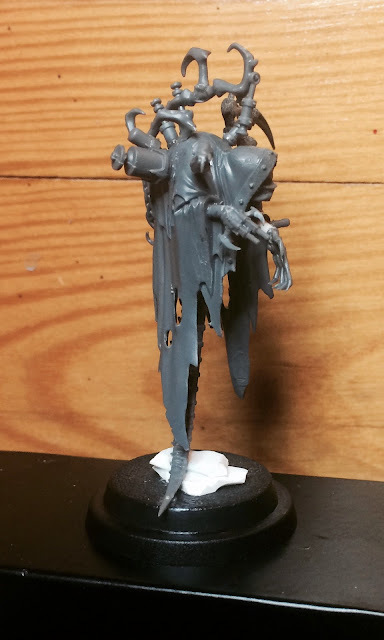 This is making me want to get my own wraith conversion finished. It looks good! From where did you get the part of the tail or spinal chord?